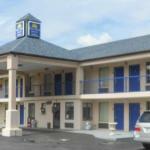 Wi-Fi and breakfast are free at Executive Inn & Suites - Covington conveniently located off Highway 51. Cable TVs are offered in all 38 rooms at the two-story hotel with exterior corridors. Rooms offer cable TV irons and ironing boards free local calls and free Wi-Fi. Non-smoking rooms can be requested. Guests can start the day with a free continental breakfast. Parking is free and pets are permitted. The Executive Inn & Suites is located off Highway 51. Get some fresh air at Cobb Memorial Park two miles away or travel four miles to play a round of golf at Covington Country Club. Memphis Motorsports Park is 32 miles away. It's 50 miles to Memphis International Airport.